This is what my son has produced to show that there is no longer Pooh Sticks allowed in 100 Acre Wood. I have printed it, and it's in the window of my Grand Marquis (to those of a foreign bent, this is a Mercury - an up-market product by Ford). It has a stonking V8, and as I've mentioned before, will seat 8 comfortably as long as they are friendly and not married. Hercules (his name) has started the habit of turning on the Check Engine light regularly. This requires a quick shift to the N position, switch off, and then restart the car, and back to D. Problem solved. There are no strange sounds from the engine, so one has to assume all is well. It does need another dose of oil, as there is a leak.... maybe Hercules is Welsh! Leak... leek... oh, never mind... On my way home from being a scrubber this evening, I saw that monumental Big M sign that make small boys pee themselves - McDonalds! I really did fancy the chicken McNuggets. I've liked them since I first tasted them in Slough in 1984. For those who are too young to remember, Slough is a town west of London, and would be unforgettable if it were not for two things. First, Sir John Betjeman, a fine Poet Laureate, wrote a wonderful poem in 1937 about Slough: "Come friendly bombs and fall on Slough! It isn't fit for humans now, There isn't grass to graze a cow. Swarm over, Death!" Secondly, if one ventures on the notorious M4 from London westward, one cannot fail to be subjected to an awful smell. The Sewage Works in Slough hasn't for years. Back to the plot. McDonalds. I drove up to the place where you must place your order. A loud voice emits, making you wish that there was a restroom nearby, and fond memories of Slough waft about. Me, "I'd like half a dozen Chicken McNuggets please, and a medium sized plain fries." (I had hear that McDonalds will allow the customer to choose whether they have a gallon of salt on their fries or not these days.) Her, "We only do McNuggets in 6, 9 or twelve, Sir." Me, "So I can't have half a dozen?" Her, "No Sir, only 6, 9 or 12." Me, "I'll take six then". What worried me more than the educational standards over these here parts was that the lovely chicken cost $1.91, but the fries, which were made from a large spud cost $2. Imagine a poor chicken somewhere scratching a living, and he becomes half a dozen - sorry six McNuggets. And a spud sprouts a medium sized portion of fries. Here endeth today's lesson. 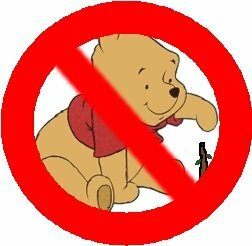 It appears that the present owner of 100 Acre Wood has decided that 80 year old (forever young) Winnie the Pooh will no longer be allowed to play Pooh Sticks in 100 Acre Wood. Nor will anyone else. Such a sad day. I recall a very pleasant afternoon in Strasbourg, France (Germany before the dreaded war) with Sonia - originally from Strasbourg, but by then living in Mannheim, Germany, and Juergen - originally from Germany, but from Los Angeles from the age of 3, also by then living in Mannheim. I suspect that Juergen never left the brain of that 3 year old child. This is not derogatory - I envy him.... He will be the subject in my Blog one of these days. A very gifted musician and one of the best mainframe engineers I ever knew. He could also drink beer. He and I worked together in said Mannheim and many other places across Europe. I love the guy to death! Back to the plot. Sonia, Juergen and I had enjoyed a very pleasant lunch on the banks of the Rhine in some hostelry that was at least a million years old. We decided to take a walk before going back to Sonia's parents house for a spot of supper. We came across an old wooden bridge of equal vintage to the lunchtime restaurant. I suggested we play Pooh Sticks. Neither Sonia nor Juergen had heard of Dear Old Winnie. In the best of British tradition, I set about fixing this lack of education – little wonder that Mainland Europe has so many problems. There was much mirth and jollification, such that parents allowed their children and dogs out to watch this event. Ever the brave, I invited a few of the kids to join in. Language to these kids was not a barrier (a rather ferocious French Poodle had to be dealt with, but then he waved his white flag), and my mixture of French and German propelled the children to learn the Art. I suspect that Le Pooh Sticks is still played in Strasbourg but I doubt if the kids even remember the name Aled The Pooh. Some years later, in this wonderful land of the USA, I was working on a Y2K project in Milwaukee, Wisconsin. It was a weekend, and my colleague and I – a somewhat 'robust' lady called Darlene – decided to sample the countryside. I can recommend it. The countryside, not Darlene. We found an ancient village (by US standards). It was built in the 1920s to support a railway that never came. But they have a slow stream and a bridge. I introduced Darlene to Pooh Sticks. Initially, mothers and fathers came out to see what was going on, even had a Crown Vic looking on, but eventually, they allowed their children out. No French Poodles this time. I’m not that keen on children as those who know me will attest (I’m of the 'best seen and not heard' brigade), but the look on their faces when they understand the Pooh Sticks activity was priceless. What was so nice is that grown-ups can get equally silly/keen over it. I know I did. Even Mr. Plod (British for Crown Vic) got into it. I still would, if I could find a stream here in Florida. As Rik relayed in his blog, if your Florida Driver's License says "Florida", one is in a flood zone. Loosely translated, that means 'no Pooh Sticks'. I suspect that Rik could generate a drawing to that effect. One of his talents that has never been used is his artwork. He is a brilliant artist. He recently drew a pencil drawing of a castle that he and I visited in Wales. I can see a picture with Pooh and his friends playing Pooh Sticks, with a red thingy across it. Here endeth today's lesson. I have a Capital One credit card. If you live in the US, you have to have one! Had it for 3 to 4 years. I use it to buy gas, and pay the $20 odd bill each month. Never a late payment, never an over limit fee. I was always told, this was the way to improve my credit status in the US - in fact they've just raised my credit limit by another $200 a month or so back, and raised my interest rate from 16% to 28.15%. I’ve never borrowed from them. A simple request by email as to why this interest rate had happened elicited no response. Now there’s a surprise. Made many phone calls. Was eventually told that “this would be looked into”. I made the last call a couple of days back. Still no response. Doesn't really matter, as I don't pay any interest, but why did it go up? Was there an 'R' in the month. Was Hades in conjunction with Mars? Had a phone call yesterday. In fact several of them, from the same number. Eventually, I answered them. Capital One. I could barely understand the lady. I kept asking her if she was responding to my request, but it seemed she had a script to follow whatever the poor customer on the end of the line responded to. I kept asking what she was trying to sell me. Seems that as my account was in good stead (it stands at $0.00) I was entitled to 3 months of free mortgage protection, ditto free life insurance to cover my burial arrangements (I wish to go in a cardboard box in a furnace - hey, I won't be there! ), insurance coverage for my personal jewelry, and $2,000 for my personal property in the event of a hurricane. I didn’t know that my pineapple plants might be worth that much. My ’92 Grand Marquis certainly ain’t worth that much. I explained that I had no mortgage and no personal jewelry – apart from my four (ex) wedding bands, this aspect was moot. I also mentioned the increase in my interest rate. The words that followed belied belief. I could not understand any of them. I protested I could not understand, but I gave up, and hung up. I hate doing that as I have been taught to be polite. Why do these companies do this? They employ some poor person from a poor country who hardly speaks English, and try to make me think that their offer is the best in the world, and how can I refuse.